The Invitational is held every year for the top 16 players of each class. and offer a special "THANK YOU" to all our sponsors. Erick Carrasco Crowned the Tri-State Tour’s 2017-2018 Invitational Grand Champion. The twenty-first annual Tri-State Tour Invitational Tournament took place June 30 & July 1, 2018 at Steinway Café and Billiards in Astoria, NY. The weekend was another huge success for the tour with 12 A & A+ Players, 26 B & B+ Players, 32 C & C+ Players and 16 D & D+ Players who earned their way in to compete in their respective classes and play for their chance to be named the Tri-State Tour Invitational Grand Champion. Steinway Café and Billiards hosted the event for the fourth year and once again provided a great atmosphere and playing environment for the players. Steinway Café and Billiards owner Manny Stamatakis and the staff including Anna and George were as always very professional, helpful and gracious. Steinway donated the room and all the table time. Their generosity and support to the players and the event as always were exemplary. The staff and everyone at the room assured the events success. Steinway Café and Billiards, home of the World Pool Series, is an excellent venue for any event, it has professionally maintained tables, a clean fresh atmosphere and some of the most scrumptious food in NYC. The event was streamed live for the first time on AZBTV courtesy of UpState Al Leon and his son Joey. Al and Joey did a great job treating the amateur players to a professional quality stream and showcase for their talents. As each day began, organizers John Leyman, Todd Fleitman, Rick Shellhouse & Daniel Cintron congratulated the players on reaching the top of their classes for the season and handed out awards to the top players of the year in each class. The Tri-State Tour added $3400 in cash prizes with another $1000 being donated to the prize fund by Dr. Michael Fedak making for a grand total of $4400. The sponsors John Bender Custom Cues, Ozone Billiards, Kamui, Sterling Gaming, Capelle’s Pool Books, Hustlin’, Pool & Billiards, Quic Slick, Blue Book Publications, Human Kinetics, Steinway Café and Billiards, Amsterdam Billiards, and Romer’s Trophies went out of their way to provide the event with excellent equipment and prizes. The sponsors as the Tri-State has always maintained are owed a debt a gratitude for their dedication to the game and the players, their efforts and generosity are what always make the event so special and such a great success and without their continued support of the sport and the players this event could not happen. Awards were presented to the top 3 players in each class, the Most Improved Player of the Year, and Sportsman of the Year. The Most Improved Player went to Matthew Klein. Matthew started the season as a C player and thru dedication, commitment to lessons and the game rose to the C+-Class and as the new season starts he will be moving up to the B-Class and will more than likely be a B+ player by seasons end. His exemplary play also became clear during the event only losing the finals of the C+-Class by a small margin to the player who would go on to eventually win the whole event. Each year the tour awards one player the “Sportsperson of the Year” award. It is awarded to someone the tour believes exemplifies what a player should be and how they should act, and this year’s award went to Ambi Estevez. His exemplary attitude at events is always shining through and other players look to him for inspiration and a kind word. He proves time and time again what other players should strive to emulate. The top players of the year in their respective classes were Max Watanabe in the A+/A class who was last years most improved player, Kapriel Delimelkonoglu B+ player, Jaydev Zaveri winning the B class for the second year in a row, the C+ and D+/D classes were won by players who won for the third year in a row. Those players were Tony Ignomirello winning the C+, and Jim Gutierrez in the D+/D class. The C-Class was won by Mac Jankov, a new player to enter the ranks of POY Champion. This year the ladies were again dominated by Allison LaFleur as she won the Ladies Player of the Year for the second straight year. The action in the tournament got going around eleven on Saturday morning, June 30 with the B+ and B class players along with the C+ and C players kicking off the event. These four brackets would play down to the final 3 of each bracket and then return on Sunday to conclude the brackets. The B+ class was dominated by Alberto Estevez who ran thru the class without looking back or trifling with the players he came up against. He beat Mio Celaj 7-5, Dave Shlemperis 7-3, Paul Wilkens on the hill in his closest match, Amir Rashed Uddin in the hot seat match 7-3 and then again on Sunday in the finals of the B+ bracket 7-4. In the B-Class Paul Madonia, who had become stuck in traffic and almost turned around and went home, played extremely well all day and got to the hot seat defeating Abel Rosario 7-6, Ilijia Trajceski 7-6, Thomas Schreiber 7-5 and Zouraiz Ellahi 7-5. Zouraiz came back on Sunday and squeaked out a 7-6 win against Thomas Schreiber to get to the B Bracket finals and a rematch against Paul Madonia. Zouraiz played well and managed to get ahead and stay ahead and win the match 9-7. Alberto Estevez continued to dominate on Sunday and he easily won the B+ / B Class playoff 7-2 over Zouraiz Ellahi. In the C+ class, the player just crowned Most Improved player of the year Matthew Klein proved why he had earned the title. He won matches against Ambi Estevez 6-4, Kevin Chong 6-4, Mike Mele 7-6, and CJ Chey 6-3 to get to the hot seat. Erick Carassco started off strong with a commanding win over Ron Lichtenberger 6-2 but then ran into a fierce player CJ Chey and lost on the hill 6-5. Erick moved to the one loss side and started his march to the grand finals by besting Tony Ignomirello 6-3, Ambi Estevez 6-3, Mike Mele 6-3, Kevin Chong by forfeit as Kevin had to be at work on Sunday. On Sunday, Erick returned to face CJ Chey again, this time winning the match 6-4. This set up a classic finals match for the C+ class between Matthew Klein, the current Most Improved Player and Erick the 2015-2016 Most Improved Player. Matthew started out strong, but Erick took his time and came back to win the set 8-5. The C Class was taken over by two players, one very well established on the tour and another who was a first-year player. Daniel Jason Decker having never been to an Invitational expected nothing but to come and have a good time, an enjoyable experience and go home. But his game proved to be peaking and he found himself in the hot seat of the C-Class by winning matches against Jowen Pichardo 6-4, John Morrison 6-3, Ada Lio 6-4 and Marc Lamberti 6-1. Ada Lio a seasoned player of many a Tri-State Invitational proved she was a force to be reckoned with. She won her first 2 matches against Vijay Patel 6-5 and Pashk Gjini 6-1 before her defeat to Daniel Jason Decker. But moving to the one loss was not a deterrent as she defeated Sabrina Sherman 6-1, Pashk Gjini for the second time in the event 6-4. Then on Sunday she returned to beat Marc Lamberti 6-4 and get to the finals against Daniel Jason Decker. In the finals it was a back and forth match with Daniel Jason coming out on top 6-4. Just as the B playoffs went Erick Carrasco dominated in the C+ / C-Class finals and won the match against Daniel Jason easily with a score of 6-2. On Sunday, the D+/D Class got under way and it became a repeat of the year before with Carlos Serrano cruising to the hot seat with wins over Shweta Zaveri 6-5, Suzzie Wong 6-4, Jim Gutierrez 6-2 and Frank Scorsonelli 6-4. Jim Gutierrez after losing to Carlos battled back with tough wins over Luis Lopez 5-2, Junko Rummell 5-4 and Frank Scorsonelli 6-5 to gain a rematch against Carlos Serrano. The match was a tough back and forth match with Jim continually coming from behind to even the games up. Then with a chance to extend the race by getting to the hill first from the one loss side Jim played a brilliant safe with his opponent on 2. As he executed the shot, he locked the cue ball on another ball and sent the object to the rail, but it was a very tough touch shot and the object ball came up millimeters short of touching the rail. Then with ball in hand Carlos played a carom shot and made the 9 to win the set. The C-Class versus D-Class playoffs started out with Carlos taking a slight lead due to the handicap and winning the first 2 games, but Erick Carrasco just took his time again and battled back to win the set on the hill 7-6. The A+/A class was won by another player who had almost turned around and went home but this time instead of getting caught in traffic he got stuck on the train and sat and waited and finally got to the room. And luckily for Victor Dabu his first opponent was a no show and so Victor got his first win by forfeit. He then went on to win against Alex Osipov 7-6, Basdeo Sookhai 7-3 and Lidio Ramirez 7-4 to get to the hot seat. Lidio after moving to the one loss side beat Duc Lam for the second time in the event 7-2 and returned for a rematch in the A-Class finals against Victor Dabu. And once again Victor proved to be too much to handle and Lidio lost the match 7-5. This provided a great A-Class versus B-Class playoff with 2 players who were simply playing great and dominating so far in the event. With the finals clearly in his sights Victor Dabu played a controlled and thoughtful game against a dominating B+ player Alberto Estevez and came away with a victory at a score of 7-4. This left 2 winners one from the upper brackets and one from the lower brackets to do battle for the Grand Champion title. As the finals set started it appeared Victor Dabu was going to cruise to a victory as he caught up the handicap quickly and went ahead of Erick Carrasco 4-0. But as Erick had done all weekend he bided his time and waited for his opening which finally came in the fifth game. Erick took the fifth game and started grinding away to get to 4-3. Victor took another game but then made a few mistakes which Erick pounced on each time to come away with multiple wins. 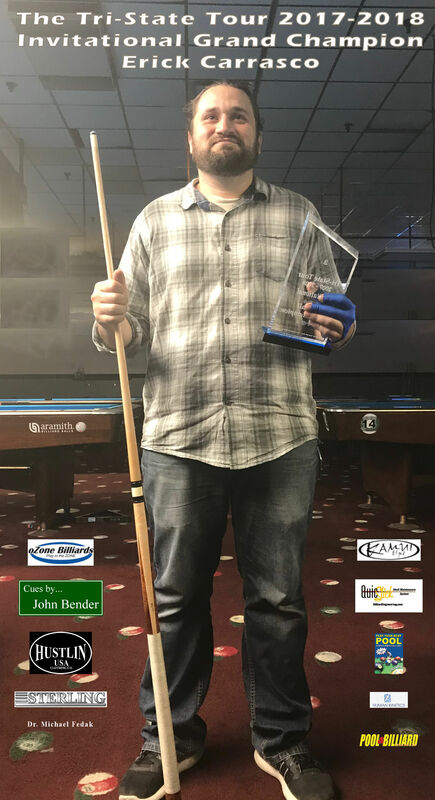 In the end Erick grinded his way to win the event with a score of 8-6 to be crowned the 2017-2018 Tri-State Tour Invitational Grand Champion and take home the trophy and special edition Tri-State 3 point custom collectors cue from John Bender.